This summer, I felt God leading me time and time again to the Fruit of the Spirit, found in Galatians 5. 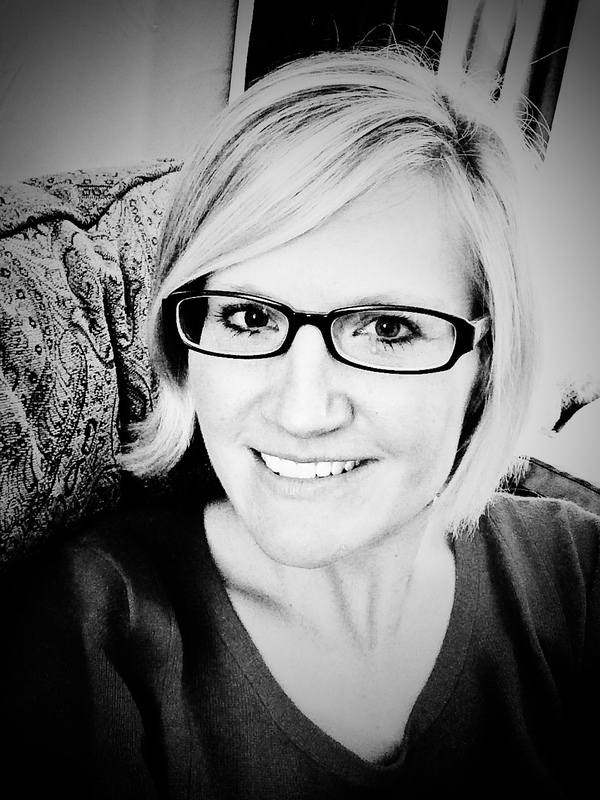 It had been several years since I had completed Beth Moore’s study Living Beyond Yourself so I decided to pull it out and go through it again. Needless to say, I needed that study. Exhibiting love, joy, peace, patience, kindness, goodness, faithfulness, gentleness, and self control is a tall order and we cannot do it in our own strength. So, last week, our family began a 9 week study of the Fruit of the Spirit. No, it isn’t as in-depth and overwhelming as it sounds. It is actually very simple, and only takes about 15-20 minutes a day (30 if the kids start asking questions). Each week, we find different ways to learn about a specific fruit. The first fruit we covered, of course, was love. Begin with prayer and then ask questions like, “Who is the Holy Spirit?”, “What do you think it means by Fruit of the Spirit?” You can talk about the fact that when you make the decision to follow Christ, the Holy Spirit comes to live inside you. At the time we started this, we had one child who was a believer and the other was getting close to making a decision. It was neat for our younger child to learn that God would live inside her if/when she made that choice. It was also great for our older child to talk about how the Holy Spirit has helped her to produce this fruit. Next, read Galatians 5:16-23. If you have a child that is reading, ask him/her to read that passage. If you have younger children and you don’t want them to know about “sexual immorality or sensuality” in verse 19 then you can read the other fruit of the flesh. We have a Kindergartener, so I didn’t read those words aloud. There was plenty to talk about with “jealousy, outbursts of anger, disputes, envy” etc. Talk about fruit trees and how you can tell what kind of fruit tree it is by the fruit that are on it. Have your kids get a sheet of paper and draw what they think the two kinds of trees would look like. This gives them a great visual to compare and contrast. OR you could draw the tree portion and they could put the fruit on it. (The fruit of the flesh will probably be brown or black). Pick out a few of the fruit listed for each type of tree–talk about them or describe what they mean. Ask your kids questions, “What is idolatry?” “Why do you think jealousy is a sinful fruit?” Let your kids ask questions too. Ask your children what kind of tree they would want to be. (They’ll point to the pretty tree they drew with the colorful fruit). Pray with your kids, asking God to teach all of you as a family about the Fruit of the Spirit. Another idea: We are using a different fruit for each week we study. 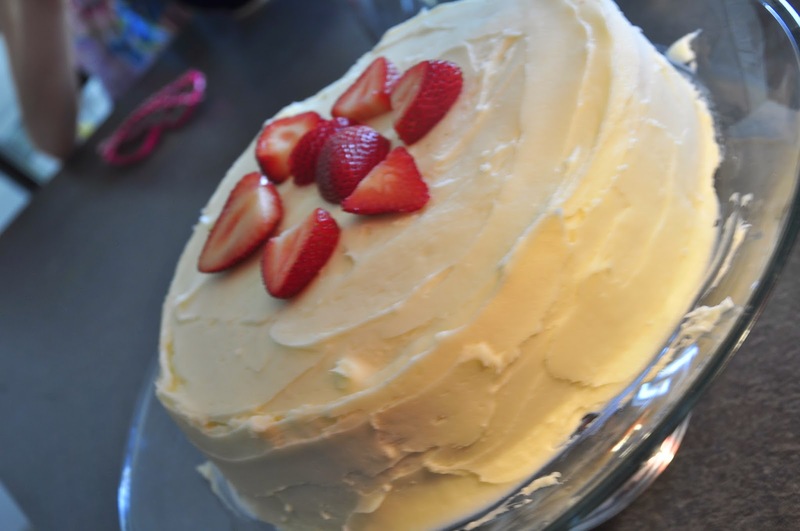 For love: strawberries, for joy: bananas, etc. I am making different dishes this week that include strawberries. When you are eating the desserts/snacks that you make with the fruit, talk about the fruit of the Spirit that corresponds. At the end of the study you could make a fruit salad with all 9 fruits to celebrate the end of the unit. Before you meet together, grab a large sheet of poster board and write LOVE at the top. Then underneath the title, make two columns: IS and IS NOT. 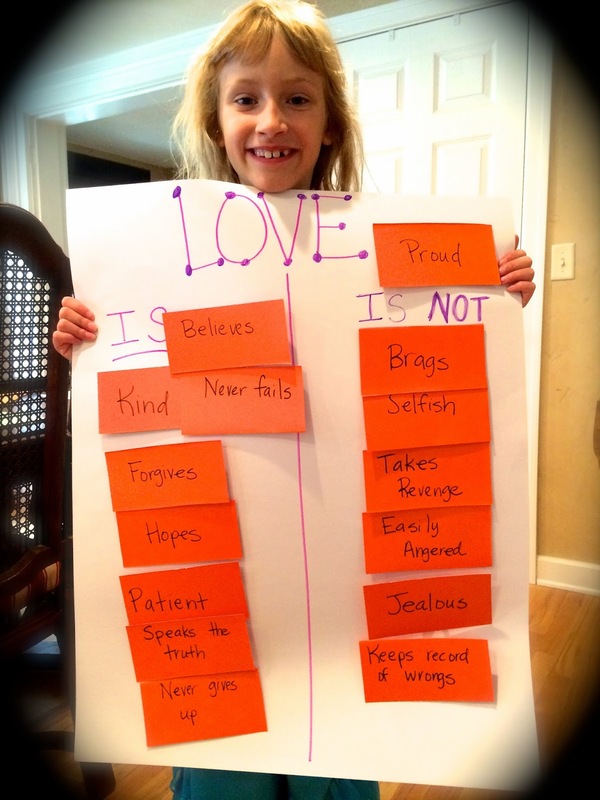 Cut out rectangular sheets of paper and label them with all the descriptions listed in 1 Corinthians 13: 4-7. For instance, on one rectangle you would write “patient” on another you would write “kind”, and another “boastful”, etc. Put a little masking tape on the back. As you can see, mine was not fancy at all, but the kids LOVED this activity. Read 1 Corinthians 13:4-7 as a family. Have your kids take turns reading a rectangle and putting it in the appropriate column. If a child selects “easily angered” he/she would put it under the IS NOT column, and so forth. Do this until all the rectangles are on the board. Talk about each characteristic and be real and open about the aspects with which each family member struggles. ACTIVITY: Sheets of paper cut into hearts, permanent marker. Hide the hearts around the house. 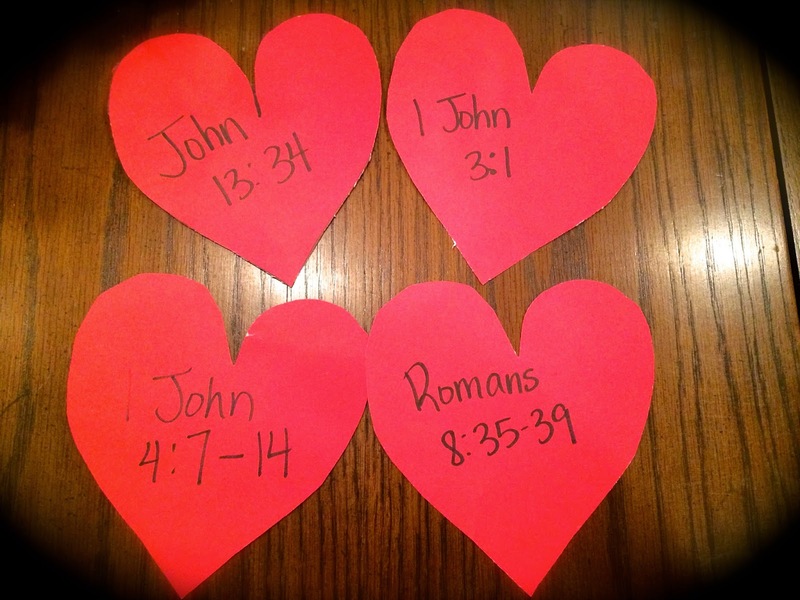 When you gather, have your kids go on a scavenger hunt to find the hearts. They will LOVE this step. If you have teens, let them hide the hearts. When they come back, have your older children read the verse listed from their own Bible. For younger children, you can read the verse on their heart. Who does love begin with? What are God’s actions that show us he loves us? Talk about other ways God shows His love: providing yummy fruits and vegetables for us, sunshine and rain, providing for all our needs. Emphasize to your kids that God’s love NEVER fails. No matter how many times we mess up, He is waiting there for us to turn back to Him. He will never leave or forsake us. His love is unconditional. Just like yesterday, cut out hearts (I made them a little smaller so that the kids could see that God’s love for us is much bigger than we could ever love Him). Have the kids go through the scavenger hunt again to find the hearts. Read the verses from the Bible. What do these verses say about how we show God we love Him? Why do we love God? (this will bring in what you covered yesterday). What are some ways we can show God we love Him each day? Martha, how does your brother show you love? How do Mommy and Daddy show you love? Martha, in what ways would you like for Daddy to show you he loves you? Just as an aside, if you have never read The Five Love Languages of Children by Gary Chapman, read it. It is a wonderful source for discovering what speaks love to your child. Have your kids make a list of these answers to hang in their room. It is a great reminder to them of how they can love other family members. A pdf with sample pages to print can be found here. Give each family member a sheet of paper and ask them to write down a list of names of people that they either don’t like or with which they have trouble getting along. Younger children who can’t write yet can talk about the friends in preschool who get on their nerves, etc. Have each family member share why they have difficultly with the names they listed. You may have older kids/teens who don’t want to talk about it. That’s okay. Just tell them to write the name down–they won’t have to tell the rest of the family who it is. But, hopefully every family member will feel comfortable sharing. If moms and dads share openly, the kids usually follow suit. As children of God and followers of Christ who have been forgiven much, how should we then treat our enemies? Give some examples from your own life about how God empowered you to love your enemies. Personal testimony goes a long way. Talk about how hard it is to show love to our enemies–be real with your kids. Have your kids write down a plan for what they can do to love their enemies. This may open up the topic of bullying in school. Be ready for that conversation and decide as parents how you feel God leading you to guide your child if he/she is bullied. What did you learn about love this week? How did God challenge you? What do you want to do differently? What was your favorite scripture about love? I am working on sample PDF files that you can download, print, and use in your own home. Right now they are rather simple and were quickly put together. I will probably come back and update them soon. See the Activity Printout page. Teenagers and older kids may appreciate Francis Chan’s Crazy Love. You can read portions of this wonderful book to them. The first few chapters really give a picture of just how much God loves us. There are also short video and audio teachings of Chan on his website. These are awesome and your kids will respond to what he has to say. Older kids may also enjoy a more in-depth look at the different kinds of love described in scripture: eros, phileo, and agape. Talk about the differences between these three kinds of love and which reflects God. Beth Moore’s study Living Beyond Yourself is another wonderful resource you can use to teach the Fruit of the Spirit. I hope that this simple, easy way to teach your children about God’s love will help give you ideas! If you have your own ideas, PLEASE share them in the comment portion of this blog!